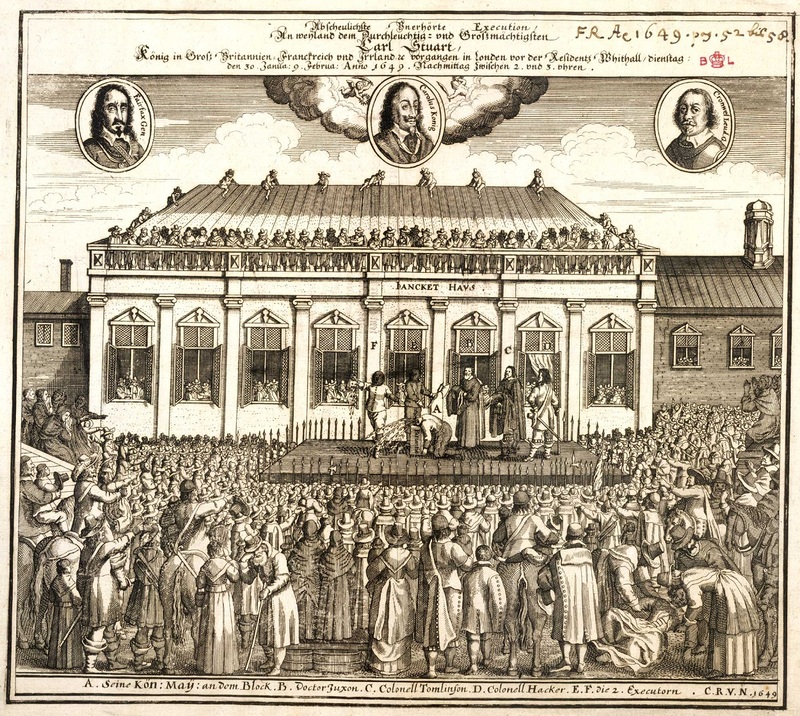 On this date in 1660, the English soldiers Francis Hacker and Daniel Axtel(l) were executed for their roles in keeping the captured King Charles I, and for eventually seeing that late king to his beheading. Hacker disdainfully turned it down. And as the wheel of fortune turned, the king would become Hacker’s prize. 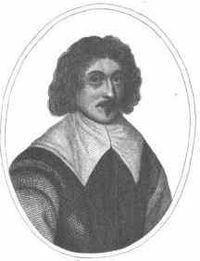 It was Hacker who commanded the detail of 32 halberdiers who marched the deposed monarch into Westminster Hall on January 20, 1649 to begin a weeklong trial — and a whole new historical era of parliamentary ascendancy. Ten days later, when Charles was led out for beheading outside the Banqueting House, it was Hacker who escorted him. Hacker might have escaped even this much participation with his own life after the restoration of Charles’s son and heir, but it came out that he had even written, with Cromwell, the order to the executioner. Detailed view (click for a larger image) of an illustration of the king’s beheading. 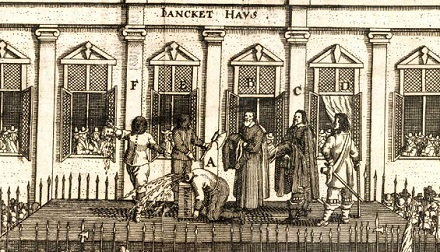 On the right of the scaffold, character “D” sporting a natty scabbard is Francis Hacker. It’s a funny little thing to lose your life over, because — narrowly considered — it was nothing but a bit of bureaucracy. Hacker et al had been given from above a commission for the king’s death. On the occasion of the execution they had to convey from their party to the executioner a secondary writ licensing the day’s beheading. But monarchs asserting divine prerogative certainly do not take such a view of mere paperwork. Huncks refusing to set his hand to this death warrant, it was Cromwell himself who personally dashed it off, then handed it to Hacker, who fatally countersigned it, just before the execution proceeded. Meanwhile, Hacker’s subaltern Daniel Axtell razzed Huncks for chickening out. Axtell, who seemingly would be right at home in the kit of your most hated sports club, was indicted a regicide for his gauche fan behavior during the king’s trial, several times inciting soldiers (on pain of thrashing, per testimony in 1660) to chant for the king’s condemnation, whilst bullying any onlookers who dared to shout for Charles into silence. Hacker did not bother to mount a defense; the verdicts were foreordained by political settlement. the Parliament, thus constituted, and having made their Generals, he by their Authority did constitute and appoint me to be an Inferior Officer in the Army, serving them in the quarters of the Parliament, and under and within their power; and what I have done, my Lord, it hath been done only as a Souldier, deriving my power from the General, he had his power from the Fountain, to wit, the Lords and Commons; and, my Lord, this being done, as hath been said by several, that I was there, and had command at Westminster-hall; truly, my Lord, if the Parliament command the General, and the General the inferiour Officers, I am bound by my Commission, according to the Laws and Customs of War to be where the Regiment is; I came not thither voluntarily, but by command of the General, who had a Commission (as I said before) from the Parliament. I was no Counsellor, no Contriver, I was no Parliament-man, none of the Judges, none that Sentenced, Signed, none that had any hand in the Execution, onely that which is charged is that I was an Officer in the Army. The two men were drawn from Newgate to Tyburn this date and hanged. Axtell was quartered, the customary fate of those regicides who had been put to death all the week preceding. Hacker, however, enjoyed the favor of hanging only, and was delivered and “was, by his Majesties great favour, given entire to his Friends, and buried” — perhaps because so many of Hacker’s family had remained true to Charles. * Axtell’s trial has a good deal of detailed bickering over the superior-orders defense, but the court itself did also take pains to differentiate the things Axtell did as an officer, such as commanding troops (for which Axtell was not charged) — and his going the extra mile and surely beyond his commission to shout for the king’s death.